An automatic pet feeder is ideal if you want to make sure your pet cat or dog has access to the right portions of food at regular intervals when you are not around. There are a number of different models available, which means that choosing one isn’t easy. So to help you decide which one is best for you and your pet we have put together this article to highlight the best automatic cat and dog food dispensers available to buy online in the UK. Unlike pet water fountains which are mains-powered, automatic pet food dispensers are usually battery powered so you don’t need to worry about getting one with the correct UK plug. There are quite a few feeders that are not available in the UK, so this list only includes those that you can buy from UK-based sellers. There is quite a lot of information in this guide, so feel free to click on the links below to skip ahead to particular sections. There are three main things to look at when choosing an automatic pet feeder. How many days ahead do you want to be able to program meals for, how many portions it can serve, and whether you can use wet and dry, or just dry food. You can buy automatic pet feeders with timers that range from 24 hours, up to 30 days ahead. The most basic just allow you to set a single time when the feeder will open, however the more advanced will let you schedule meals at different times of the day. Automated pet feeders fit into two different styles – those that have individual feeding bowls that open up when scheduled, and those that serve a pre-determined amount of food into a single feeding bowl at the programmed time. It is possible to buy feeders with between 1 and 6 individual feeding bowls, with portion sizes between 175 and 500ml. The feeders with a large storage bin that dispenses food into a single bowl range in size up to 10 litres, which is enough to provide regular meals for a number of weeks. All the pet feeders reviewed here are suitable for dry food, however many can be used with wet food too. 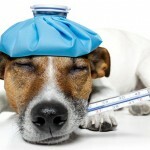 Some also allow you to fit an ice pack which helps keep wet food fresher for longer. 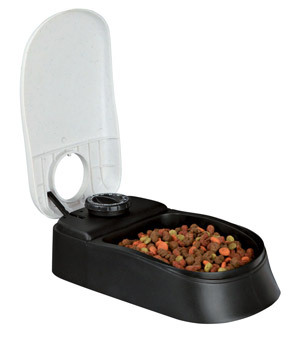 Automatic pet food dispensers either have a food bowl that is always open, or have lids which seal the food compartment until they are programmed to open. The sealed feeders will prevent your pets from eating the food too early, and will also protect it from drying out, and also from flies and insects. There are three main types of automatic pet feeder, and all have their advantages and disadvantages. The first type has a hopper on top, which drops food into an open container below. These are only suitable for dry food, and the main advantage is that they have a larger capacity than the other types of feeder. This means you can schedule food to be dropped for a longer period of time than with the other types of feeder. The next type of automatic pet feeder is the rotating tray type. These typically have around 4 to 6 trays which rotate at scheduled times and move the next full tray of food to the access hole. Some of these feeders come with ice packs, and can be used with wet food as well as dry. The third main type of feeder is the tray with a hinged lid. 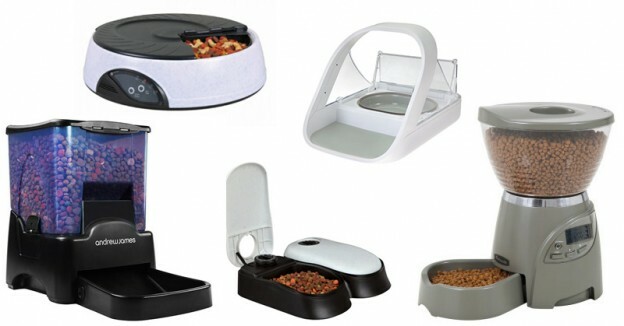 These are the most basic form of pet feeder, and only have one or two food compartments. While these are generally the cheapest pet feeders available to buy, they are rather limited and only suitable for 1 or two meals. Some of these feeders also come with ice packs, so can also be used for wet food as well as dry. Some feeders have a voice recorder function, which allows you to record a short message which is played when the timer operates to provide a meal. This can help let your pet know that their dinner is served. It is also possible to buy a microchip cat feeder which is programmed to only open when it recognises your cat’s microchip. 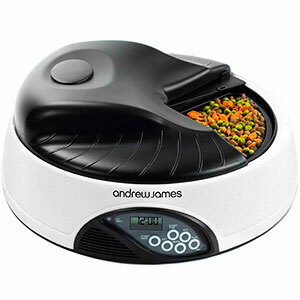 This 4 Meal Automatic Pet Feeder from Andrew James is almost identical to the Trixie TX4 Plus, but is branded differently and comes in different colours. It is slightly cheaper too, so unless you really want the colours that the Trixie comes in, then you can save yourself some money and buy this version. This feeder is suitable for both wet and dry food, and the food bowl features 4 equally sized compartments of 500ml each. In addition, there is an extra chamber on top of the feeder which can be filled with ice to keep the food cool and fresh. 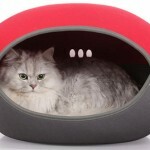 Alternatively, this chamber can be left open and used as a water bowl if you prefer. The feeder also comes with 2 “volume reducers” which allow you to serve smaller portions (200ml), and an adaptor tray for square foil food containers. The bowl and trays are easy to take apart which makes cleaning very easy. The control panel is easy to use, and allows you to programme the feeder to open at 4 different times. You can also pre-record a voice message of up to 8 seconds which plays when the feeder opens, to let your pet know it is dinner time. The feeder will remain open until the next feeding time, which lets your pet eat at their own pace, but still receive meals on a regular schedule. Spare volume reducer trays are available to buy too. 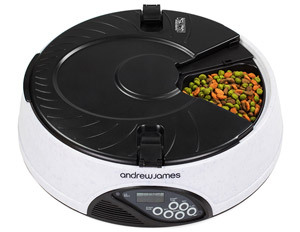 The 6 Meal Automatic Pet Feeder from Andrew James is similar to their 4 meal version, but does not have an ice pack, and has 6 (smaller) food trays instead of 4. The control panel is similar to that on the 4 portion feeder, and allows you to specify 6 different feeding times. At the scheduled feeding time, the feeder will cycle to the next full food tray and the cover will open automatically. 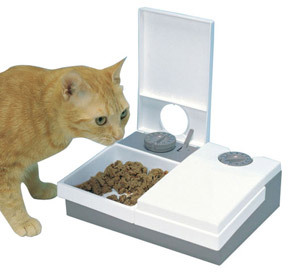 This allows your pet to eat at their own pace, but on a regular feeding schedule that you control. The 6 feeding compartments are each 175ml in size, and are ideal for dry food. You can use wet food too if you want, however as this feeder doesn’t have an ice pack, it wouldn’t stay fresh for a huge amount of time – especially in warmer weather. This feeder also features a voice recorder that allows you to record 8 seconds of voice message. This message is then played 3 times at every feeding time to let your pet know it’s time to eat. The reason for it being played 3 times is in case your cat doesn’t hear the message the first or second time! The feeder requires 4 x C batteries (which aren’t supplied) to operate. There is a low battery warning light to let you know when these need changing. The body is made from a sturdy plastic that is easy to keep clean, and features durable anti-tamper lid clips. 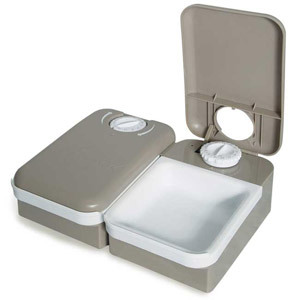 The feeding trays are also easily removable for ease of cleaning. 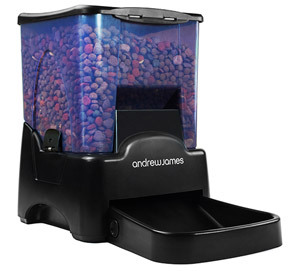 Unlike their 4 and 6 day feeders, this 90 Day Pet Feeder from Andrew James is designed for dry food only. The timer can be programmed to feed your pets up to 4 times a day, and the 10.6 litre capacity means it can hold enough food for up to 90 days (with 1 meal per day). You can specify the portion size too, with 10 options from ¼ cup to 2.5 cups. The feeder will also automatically detect if the food tray is full, and won’t dispense additional portions if this is the case. In common with the other pet feeders in this range, the 90 Day Feeder allows you to record a voice message of up to 6 seconds which plays when the food is dispensed to let your pet know when their food is served. The battery-powered feeder features a pet-proof lock on the lid, which will prevent any unauthorised snacking. The easy to use control panel also includes an LCD clock and a low-battery indicator. A fresh set of batteries should last around 1 year. The Cat Mate C10 from Pet Mate is an automatic cat feeder that can feed your pet cat (or even a small dog) a single meal while you are away. 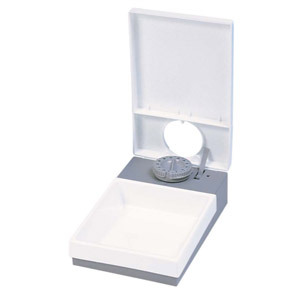 Up to 450g of wet food (enough to feed 2 cats) is kept fresh in the feeding compartment by the closely fitting lid, however unlike the larger C20 feeder, this one does not feature an ice pack. You can set the batter-powered timer to open the lid automatically up to 24 hours later. The single AA battery should last for around 1 year. Both the lid and bowl are removable from this cat food dispenser for easy cleaning, and are dishwasher-proof too. Also, another useful feature is that if your pet has a habit of pushing their bowls around the floor, this one can easily be fixed to a piece of wood to help keep it in place. 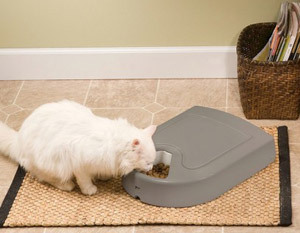 The Cat Mate C20 from Pet Mate is similar to their C10 automatic cat feeder, but this model has 2 feeding bowls. There are a couple of other differences too; the timer is 48 hours (compared to 24 on the C10), and this model includes an ice pack which helps keep the food cool. 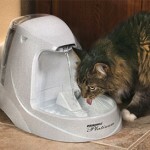 Despite the name, this automatic feeder is also suitable for small dogs as well as cats. Pet Mate is a well-known brand, and this particular model has been around for a while and is very popular. 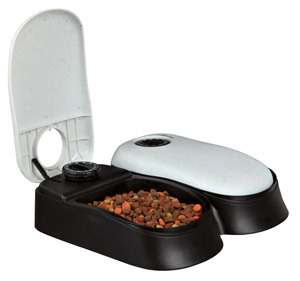 Each feeding compartment can hold up to 450g of wet food, which is larger than many other cat feeders. Each tray is controlled by its own battery-powered timer which can be set to open the lid at any time up to 48 hours ahead. The feeder requires a single AA battery, which should last for around 1 year. However this feeder does not have any sort of low-battery indicator so you will need to make a note of when you should replace it. The ice pack fits beneath the food trays, and helps keep wet food cooler and fresher. After use, simply freeze it again in your freezer. To set the timer, simply turn the dial to the number of hours delay you require, and then start the timer with the small switch on the bottom of the unit. 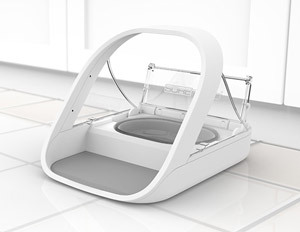 Like the C10 feeder, the food bowls and lids are easy to remove for cleaning, and they are dishwasher-safe too. This feeder can also be attached to a piece of wood so it doesn’t get pushed around by a large pet. The Cat Mate C50 from Pet Mate features 5 feeding compartments, each big enough to hold 300g of wet food, which is enough for 2 cats or a small dog. Two ice packs under the bowl help keep the food fresh, along with the close-fitting lid. A battery-operated timer lets you set up to 4 opening times over a 4 day period, and the battery should last for at least 1 year. While the feeding bowl has 5 compartments, one of these is always open, so it’s only possible to schedule 4 meals for future times. The bowl and lid are easy to remove for cleaning, and are dishwasher-proof too. The Cat Mate C500 Automatic Cat Feeder with Digital Timer is very similar to the C50, but has a digital instead of a mechanical timer. The Cat Mate C300 Automatic Pet Feeder is a smaller, 3-meal, version of the C500 feeder, and is slightly cheaper. The Cat Mate C3000 and Dog Mate D3000 feeders from Pet Mate are virtually identical feeders, but the difference between them is that they have slightly different feeding nozzles to suit the different kibble sizes of cat and dog food. These feeders are both designed to be used with dry foods, with a maximum size of 16mm. 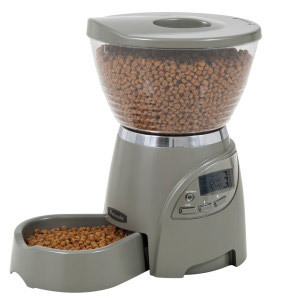 The C3000 automatic cat feeder is designed to dispense the smaller size of dry food that cats eat, while the D3000 timed dog feeder is designed for larger dog-size kibble. It is recommended that the Dog Mate D3000 is NOT used with small, free-flowing food (smaller than pea size). The battery-powered timer allows you to program up to 3 meals per day, and you can specify the amount of food in units of approx. 10g. You can even specify different amounts for each of the 3 feeds during the day – for example 8 units in the morning, 4 at midday and 6 in the evening. The timer can also be programmed to serve a specified amount over a period of time (e.g., a total of 12 units daily, at regular intervals between 9am and 10pm). 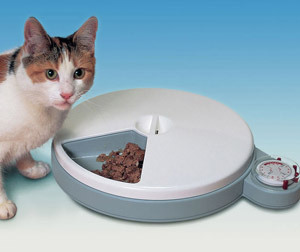 This is designed for pets with specific dietary requirements (for example diabetic cats), or if you want to regulate how much food your pet eats. In addition, you can manually serve an extra portion (or portions) at any time. The LCD indicator includes a low-battery warning indicator, and the batteries should last between 6-9 months in regular use. The plastic hopper can hold up to 3kg of food, and is easy to clean, along with the bowl, lid and feeding mechanism which are all dishwasher-safe. This feeder can also be attached to a wooden board to prevent it from being knocked over by your pet. The Feed and Go smart pet feeder is the first automated pet feeder we’ve seen that can be controlled from anywhere in the world. By using any computer, tablet or smart phone (including iPhone and Android) connected to the internet, you can set up feeding schedules wherever you may be. The feeder easily connects to your home internet router via Wi-Fi, and means you don’t need to configure the timer with complicated combinations of button-presses, but can do it very quickly and easily via a web page. You can even log in and command the feeder to do a one-time feed – very useful if you’re delayed getting home and want to make sure your pet gets their meal at the usual time. 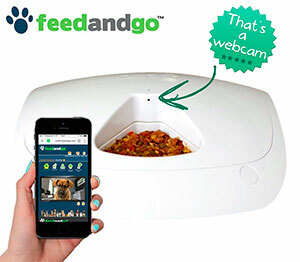 This feeder is also the first we’ve seen that features a webcam built-in, so you can remotely view your pet enjoying their meal via the web page on your smart phone, tablet or computer. It also features a 6-second voice recorder so the feeder can play a short message to let your pet know it’s feeding time. 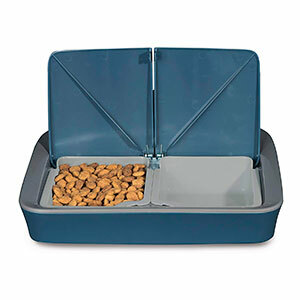 This feeder has 6 compartments, each containing up to an 8oz cup size of wet or dry food. The feeding tray has a locking mechanism, so this feeder should resist even the most determined attempts by your pet to try and break in! Although you can use wet food, this feeder doesn’t have a ice pack feature, so it’s only recommended to leave wet food in there for 24-48 hours at most. The feeding tray is very easy to remove, and is dishwasher safe to make it easy to clean. The feeder is also almost impossible to knock over, as the wide and low design makes it very stable. Unusually for automatic pet feeders, which are usually battery powered, this feeder is mains powered so you never have to worry about the batteries running out while you are away. 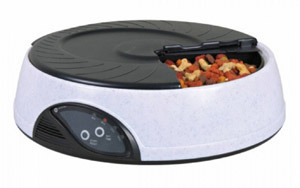 The Le Bistro Food Dispenser from Petmate is also known as the Petmate Portion Right Programmable Pet Feeder, the Infinity Programmable Feeder and also the Trixie Le Bistro. Despite the many identities, the feeders are exactly the same other than the name on the front. The food hopper can hold up to 2.25kg of dry cat or dog food, and the batter-powered timer can be programmed with up to 3 feeding times per day, with individual amounts of food specified for each meal time. The amount of food dispensed can be set from 60 to 480ml each meal time (1/4 cup to 2 cups). The food bowl and container are easy to remove for cleaning, however they are not dishwasher-safe. The 2 Meal Pet Feeder from PetSafe allows you to schedule 2 meals for your pet up to 48 hours in advance. Each of the two food trays has a capacity of around 350ml. The battery-powered timer is similar to that on the Cat Mate C20, however unlike the Cat Mate product, this feeder does not include an ice pack and therefore is only recommended for dry food. The food trays are easy to remove, and dishwasher-safe for easy cleaning. The 5 Meal Pet Feeder from PetSafe will enable you to schedule up to 5 meals for your pet cat or dog. Each of the 5 trays can hold up to 230g of dry food. Unlike the Cat Mate C50, this particular feeder doesn’t have any way to use an ice pack, so it is recommended to use dry food only. By using the battery-powered timer and LCD display, you can set the timer to provide your pet with 5 meals at any time, so it is possible to feed your pet 5 small meals a day, or 1 meal per day for the next 5 days. The food tray is easy to remove and dishwasher-safe too, which makes cleaning easy. The timer requires 4 x D type batteries, and these should last for between 6-12 months. The Digital Automatic Pet Feeder from PetSafe is most suited to cats and small dogs, and each of the two the food bowls can each hold up to 200g of dry food. The digital timer allows you to specify accurate feeding times up to 4 days ahead, and it also operates very quietly – ideal if your pet is scared by other noisier feeders. The LCD display also includes a low-battery indicator. The two food bowls are dishwasher-safe, and easy to remove which makes cleaning simple. They do not have any way to fit an ice pack however, so this feeder is recommended for dry food only. This automated pet feeder requires 4 x AA batteries to run, which are not included. The SureFeed Microchip Pet Feeder from SureFlap is slightly different to the other feeders reviewed here, as it doesn’t have a timer. Instead, it can be programmed to recognise your cat’s microchip (or the supplied RFID collar tag), and only opens up when they approach the feeder. This feeder is perfect if you have pets who steal each others’ food, or want to make sure that prescription food is only eaten by the right pet. It’s also great for pets who are on weight management diets, as it will prevent them from eating food meant for your other pets. The feeder comes with two bowls – a single 350ml bowl, and a split bowl (2 x 150ml) so you can feed your pet both wet and dry food at the same time. This feeder doesn’t have an ice pack to keep wet food cool, although it does have an integrated seal which helps keep food fresher and away from flies when the lid is closed. You can also purchase spare bowls with matching mat. It is possible to program the feeder to work with up to 32 microchip numbers, and you can also buy additional RFID collar tags. The Trixie TX1 Automatic Pet Feeder has a single food bowl and a 48 hour timer. 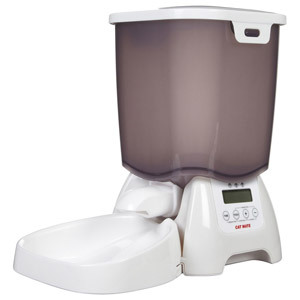 The easy to clean plastic food bowl has a capacity of 300ml, which is enough for a single meal of wet or dry food. The feeder also includes an ice pack, which keeps wet food fresher for longer. This is a similar feeder to the Cat Mate C10, however the difference is that this one features an ice pack and 48 hour timer (vs 24 hour for the Cat Mate), however the Cat Mate feeder does have a larger feeding bowl. The battery-powered timer is easy to use, and allows you to set the feeder to open at any point in the next 48 hours. The TX2 Automatic Pet Food Dispenser from Trixie is basically two TX1 feeders joined together. It features twin 300ml plastic feeding bowls for either wet or dry food, and each bowl has its own battery-powered 48 hour timer. As with the TX1, the bowls are easily removed for cleaning, and they each have ice packs underneath which help keep wet food fresher for longer. The feeder can also be used for dry food. The TX4 Automatic Pet Feeder from Trixie is very similar to the 6 Meal Automatic Pet Feeder from Andrew James, however this particular feeder has 4 rather than 6 feeding bowls, which means these bowls are larger – at 500ml in size. The battery-powered timer is easy to use, and allows you to program the feeding time to once every 4, 8, 12 or 24 hours. The timer on this particular feeder is not as sophisticated as that on the Andrew James version or the Trixie TX4 Plus, so you may want to consider one of the other feeders if you require more flexible feeding times. This feeder can be used for wet and dry food, however it doesn’t come with an ice pack so it won’t keep wet food as fresh as other feeders that do have that feature. This entry was updated in Cat, Dog, Products on January 7, 2019 by Ed.